More and more people are using nutritional supplements and natural remedies for health, but people with diabetes don’t always understand how herbs and supplements can affect them. Many supplements can intensify and interfere with prescribed medications for diabetes. 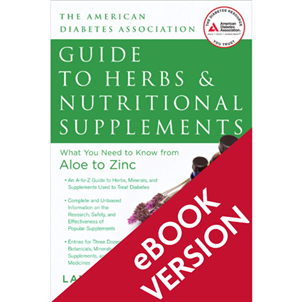 The American Diabetes Association® Guide to Herbs and Nutritional Supplements lays out, in clear terms, pertinent information about why these popular herbs and nutritional supplements are used and how they affect prescription drugs. Take the guesswork out of taking herbs and supplements with this informative guide.